This Christmas, my mom gifted me one of her biggest thrift-store scores of 2010: A 57-piece set of blemish-free Blue Ridge china. 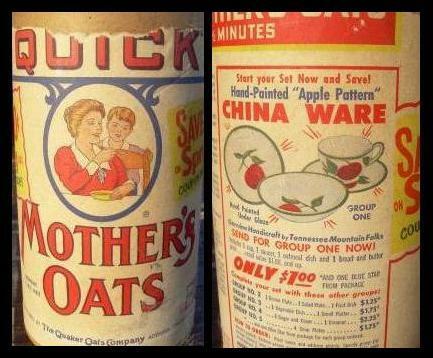 The pattern is Quaker Apple, which was produced in 1953 as part of a promotional deal Blue Ridge had with Quaker Oats. That year, housewives reaching into their box of oats were surprised with a full-sized china teacup featuring a hand-painted deep red apple and and trimmed in green. Encouraged by the ad on the back of the container saying “start your set now and save!,” homemakers built a collection of hand-painted ceramics $1.95 at a time. A spoon rest, oatmeal bowl and bread plate today, a set of plates or a handful of soup bowls a few months down the line. Bit by bit, piece by piece. A few years after this, Blue Ridge stopped producing china. The market had dwindled, drawn away by the lure of indestructible plastic dinnerware. 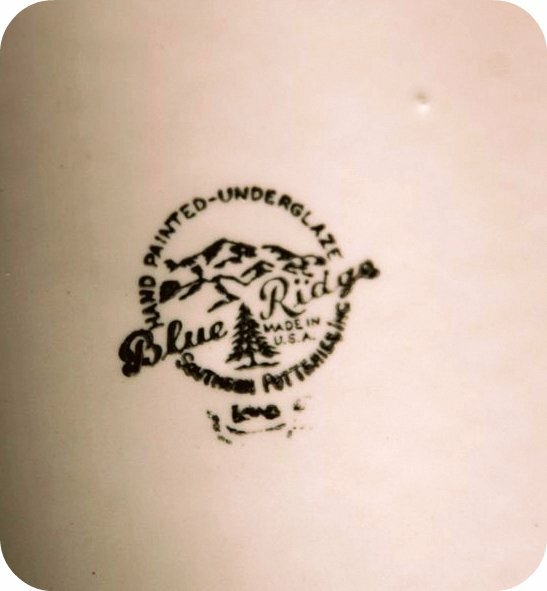 Most larger pieces made after the ’30s have the Blue Ridge stamp. Some are numbered, most are not. Very limited collections of hand-signed pieces were also produced. If you were wondering what 57 pieces of china looks like, this will give you some idea. 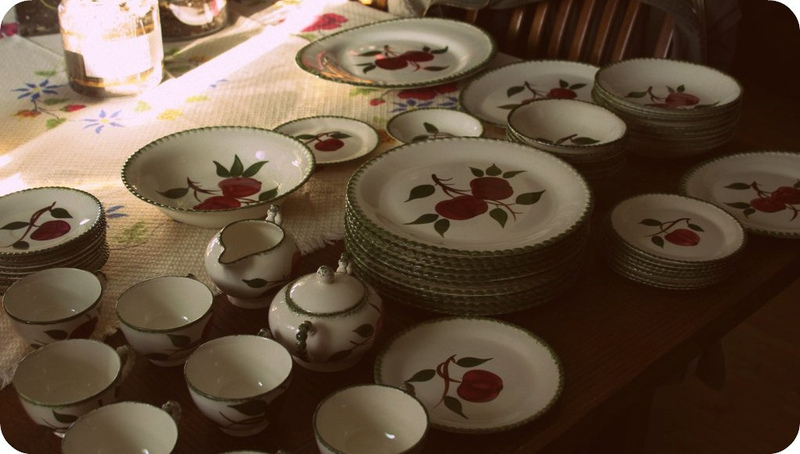 10 dinner plates, 10 saucers, eight small plates, seven fruit/dessert bowls, seven soup bowls, seven teacups, three various-sized platters, an oatmeal bowl, a sugar pot, a creamer, a spoon rest and a large salad bowl. Sweet, right? At first, I was a bit off-put by the “is that a teacher present?” vibe the apple was giving off. But once I started looking at the different pieces and noticed the one-of-a-kind-ness each one had, I fell a little bit in love. I think I’m going to use them everyday, since I’m definitely more of an “every day is an occasion” type of person. I feel very lucky to have received such a surprising, sweet gift this year. (Thanks, Marmee!) I hope you all had very merry Christmas weekends, too. Did any of you get your socks knocked off by a gift, big or small, thrifted or not? 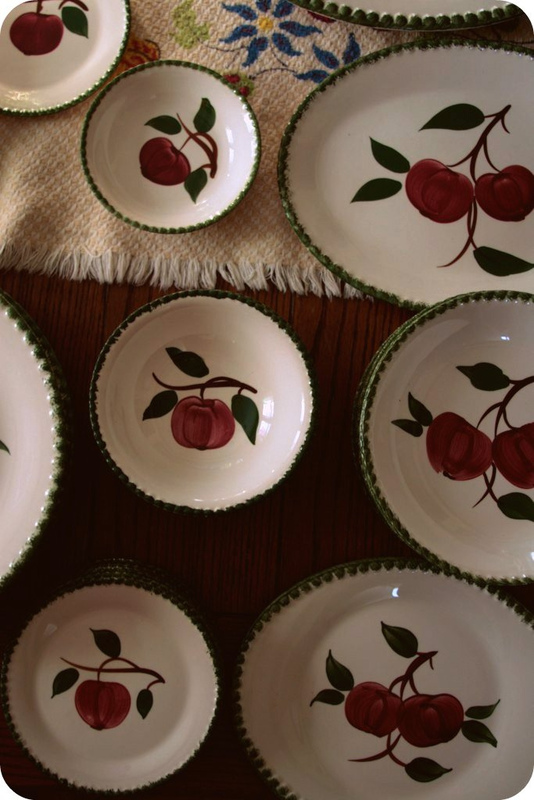 This entry was posted in Uncategorized and tagged Blue Ridge China, Christmas, family, vintage by highplainsthrifter. Bookmark the permalink. That is truly a thrift store score. I have never seen a full set of dishes. By the way, the name of your blog is perfect. Full sets of dishes are hard to come by, no doubt! I feel pretty lucky! Oh! I am so envious! Those are lovely.